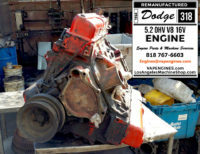 Remanufactured 1964 Dodge 318 Engine. 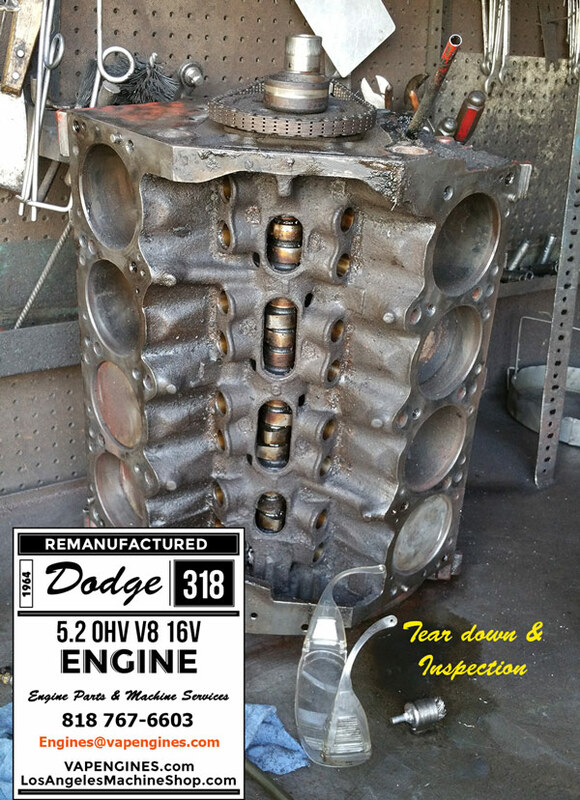 Dodge 318, a classic beast of an engine in for a complete rebuild. On the agenda; Inspect, Tear down, Bore and Hone, Grind & Polish Crank and Cam, plus Valve Job. 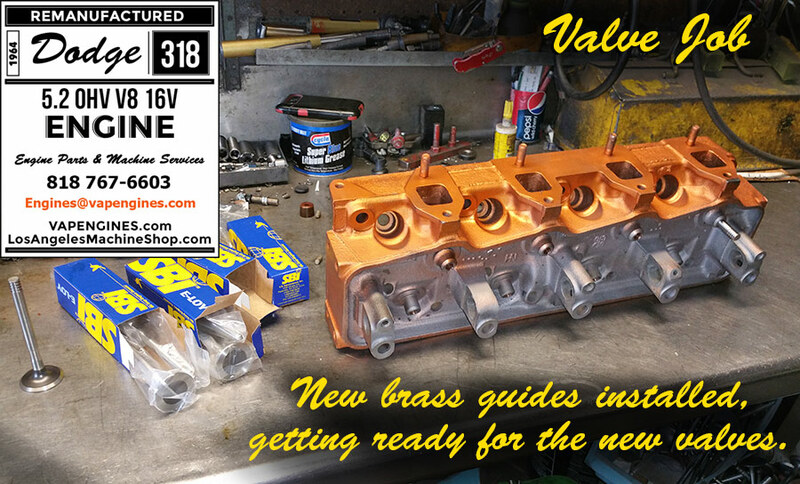 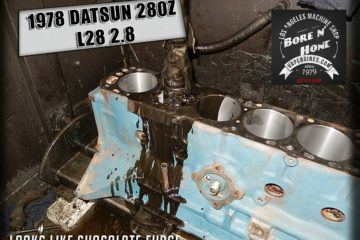 Install New pistons, rings, bearings, gaskets, freeze plugs, oil pump and timing. 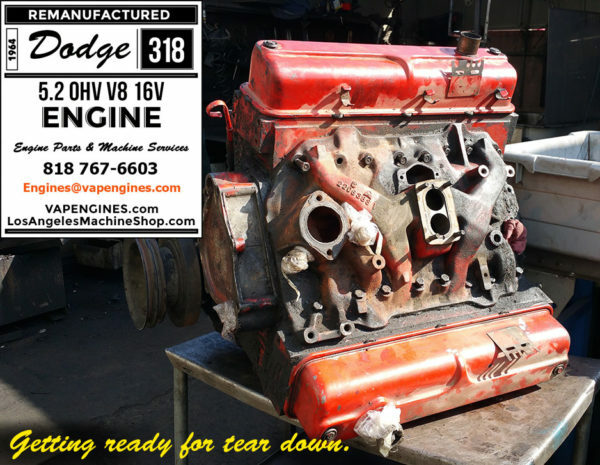 Any missing or broken parts are replaced. 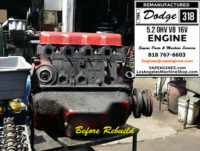 A few before shots for comparison later. 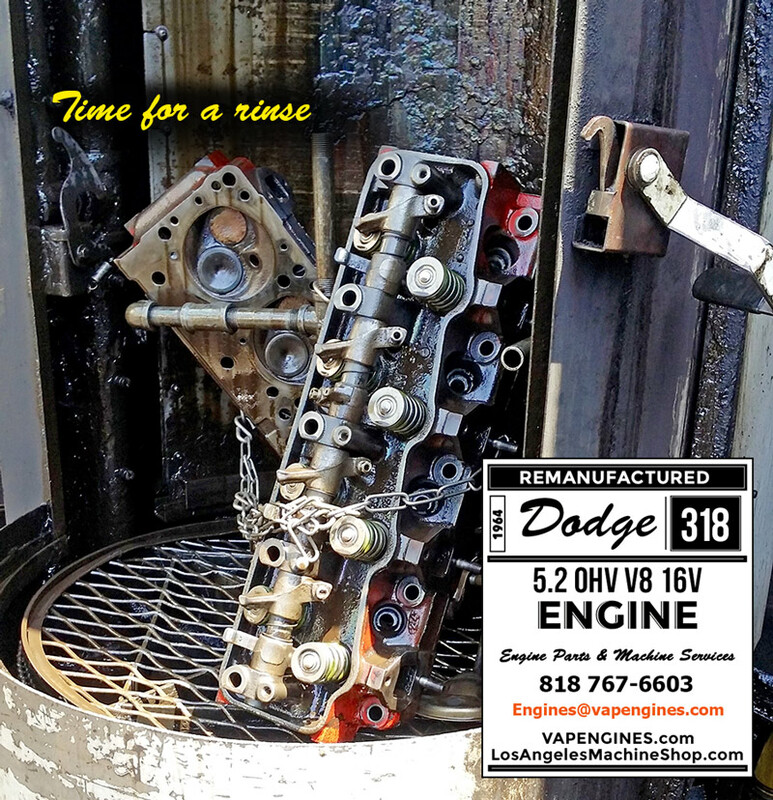 Checking it out for any unseen problems, cracks, etc. 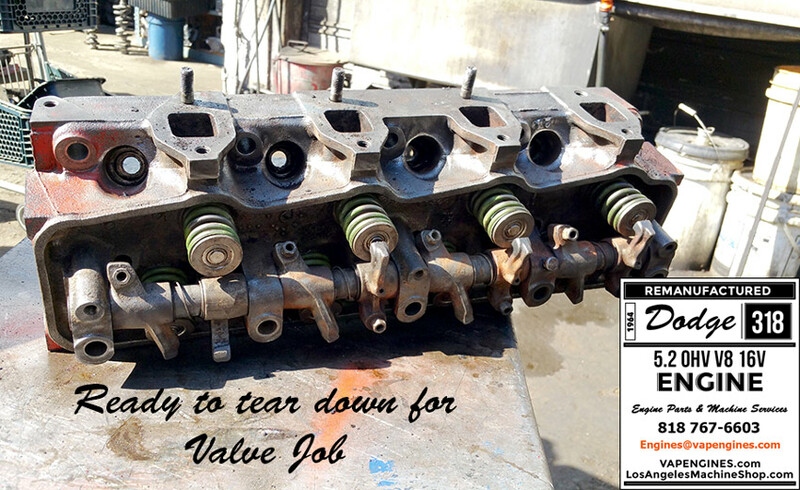 Cylinder heads and engine block need a clean up, hot tank, and a scrub before we can start any work. 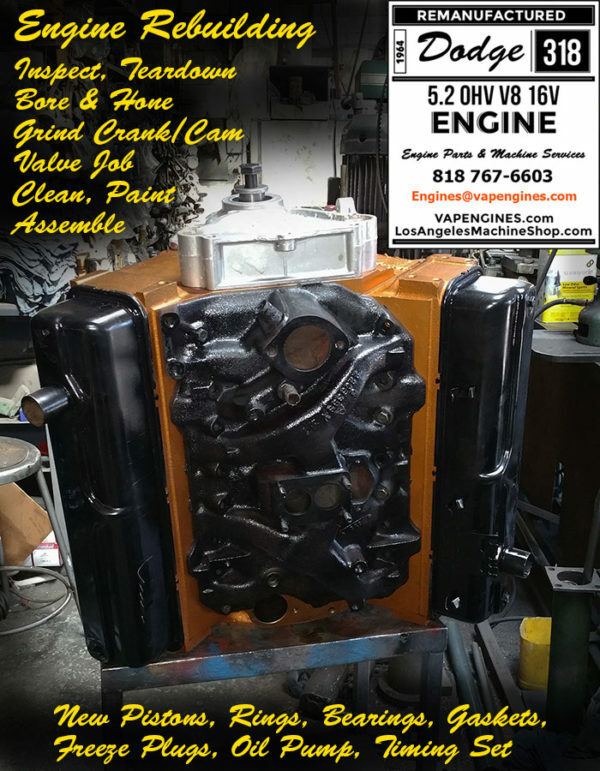 Every part gets a deep clean to remove all that baked on grease. 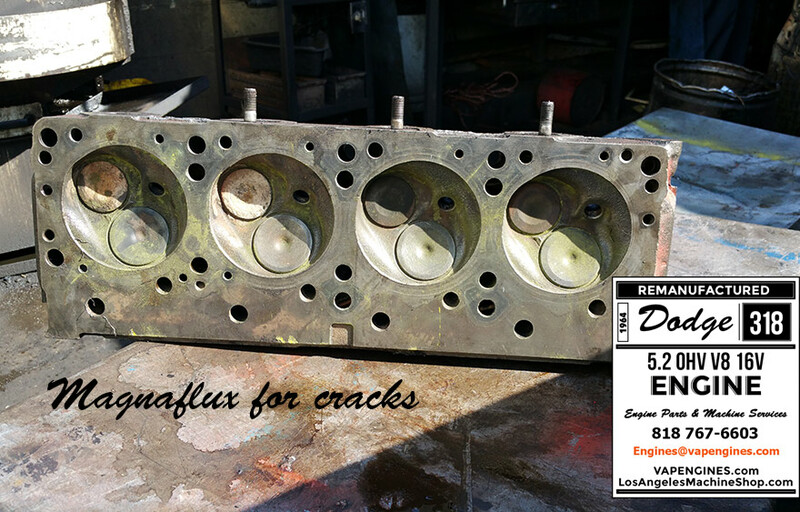 Then we inspect them again and magnuflux for cracks. 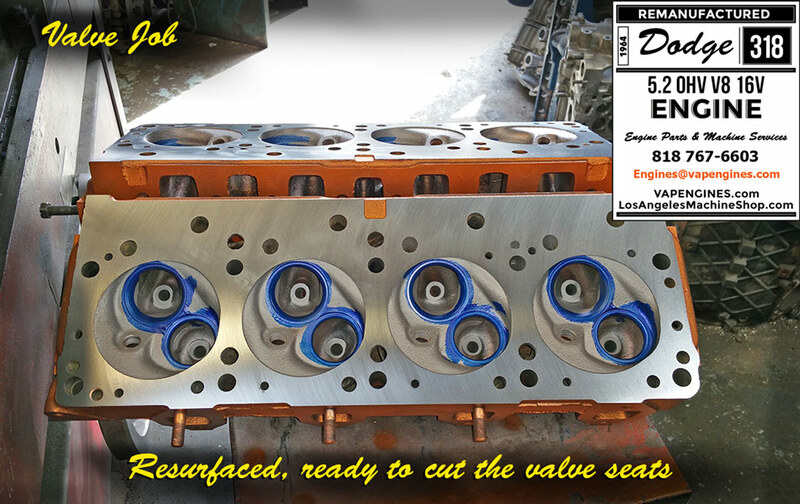 After clean up on the cylinder heads, we move on to the Valve Job. 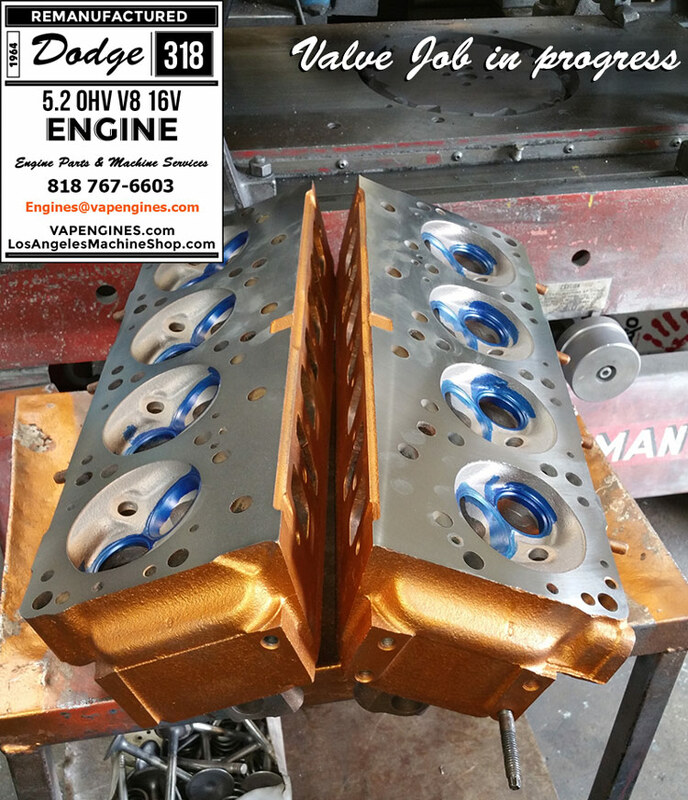 Valve Job included; Magnaflux for cracks, Pressure test, Grind valves, Cut valve seats, New valve stem seals, New brass guides, Resurface, Clean, Paint and Assemble. 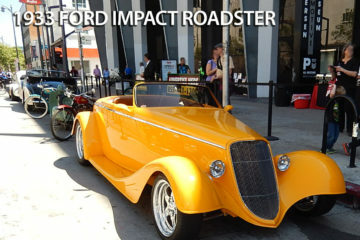 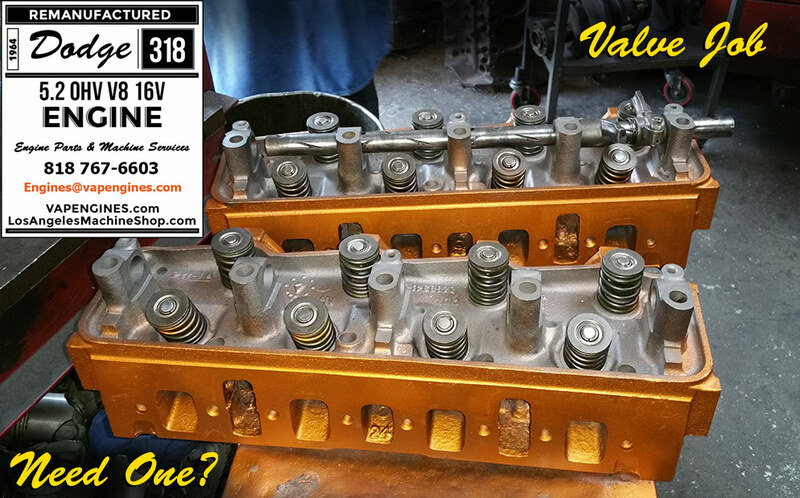 Any missing or broken parts are replaced (valves, seats, guides, seals, springs, etc). 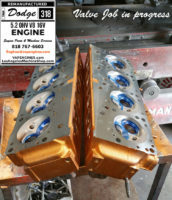 Check out the progress shots. 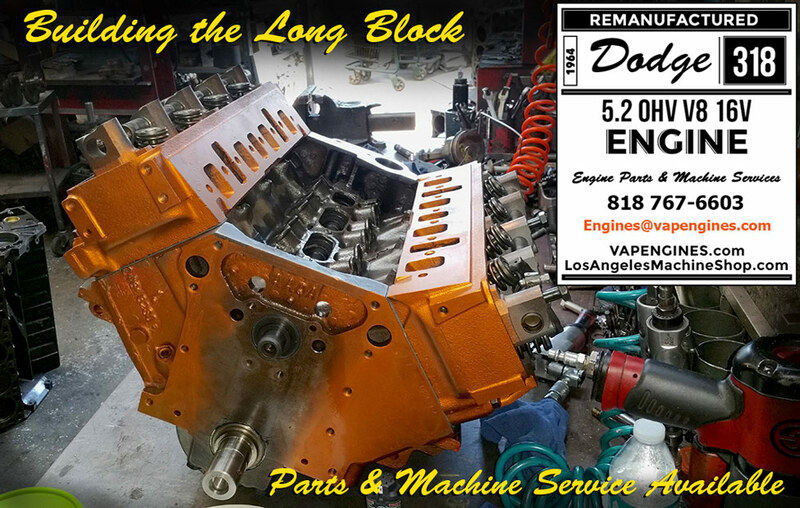 Part of the engine remanufacture process is the block work. 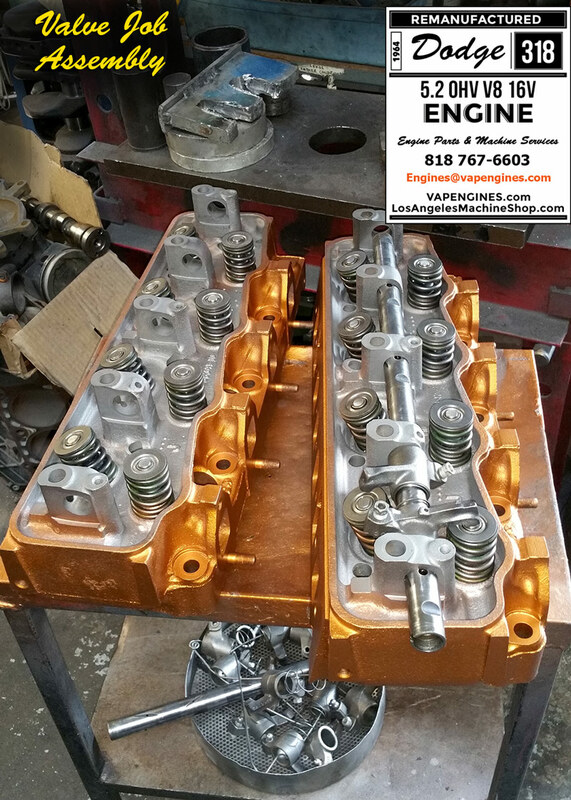 Bore and Hone the cylinders is up next. 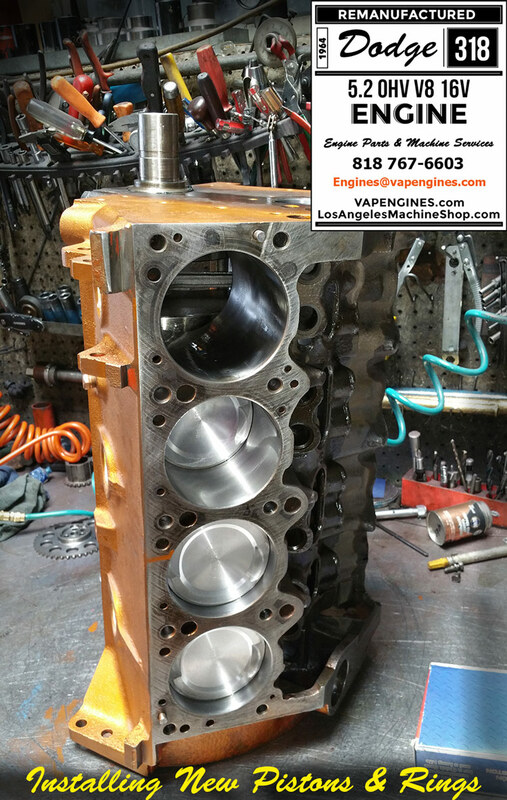 Bore and hone is complete and we can start installing the Crank, Cam, New pistons, rings, bearings, and timing set. 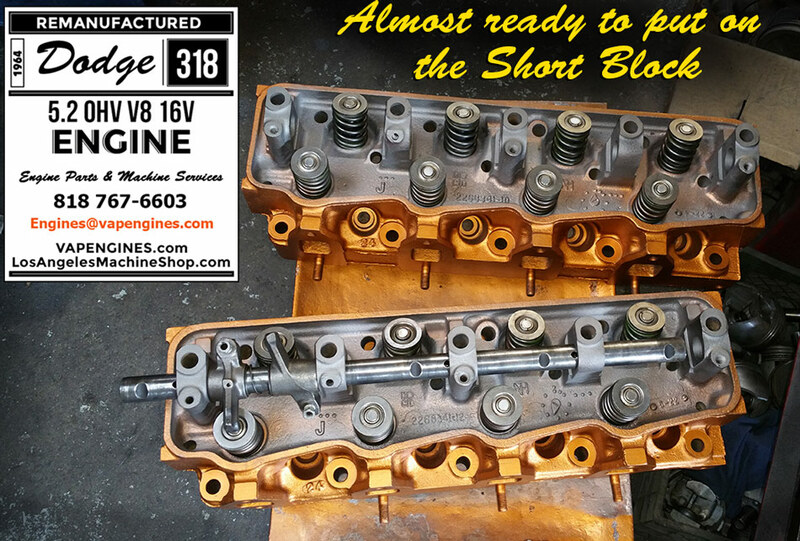 Shot of the Dodge 318 Short Block assembly. 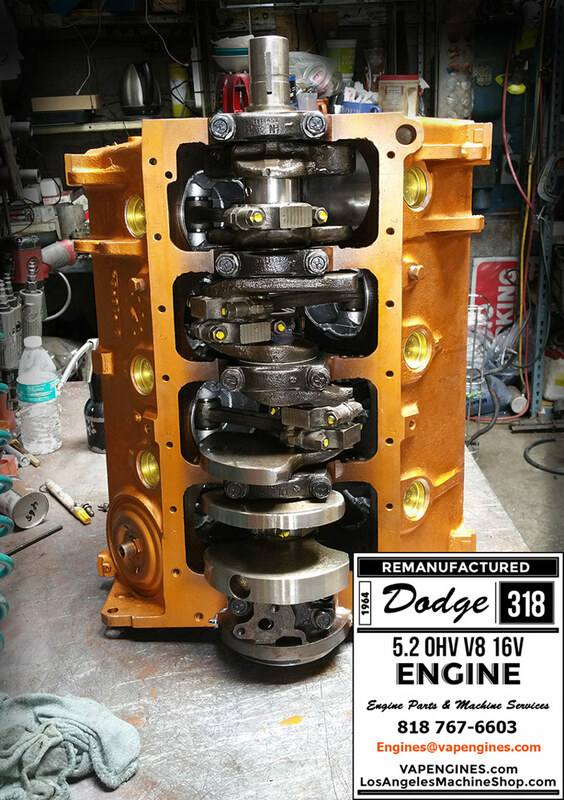 It’s all coming together nicely. 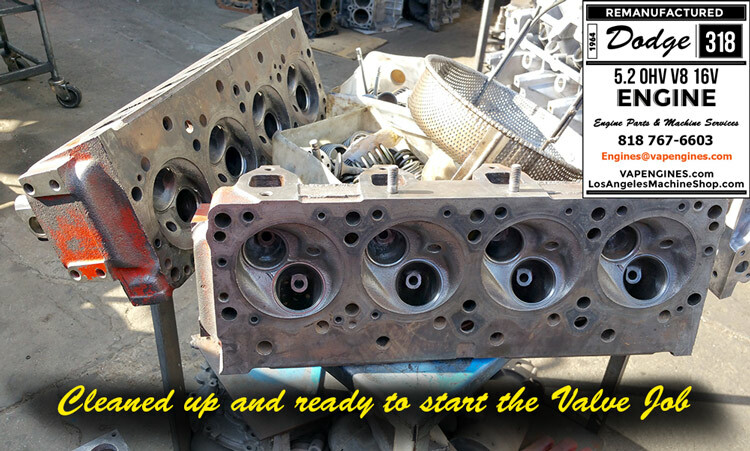 Valve Job is complete and we are ready to bolt on the cylinder heads and start torquing things in place. 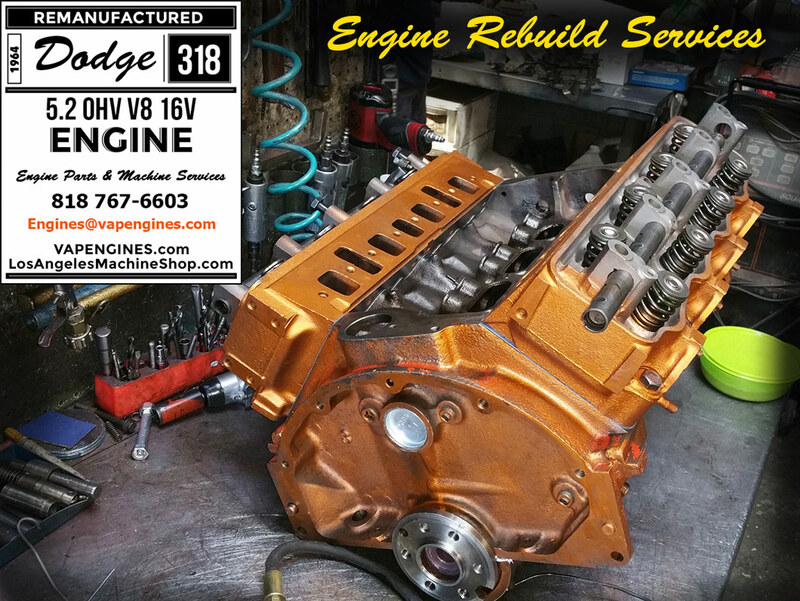 Another complete engine rebuild finished! 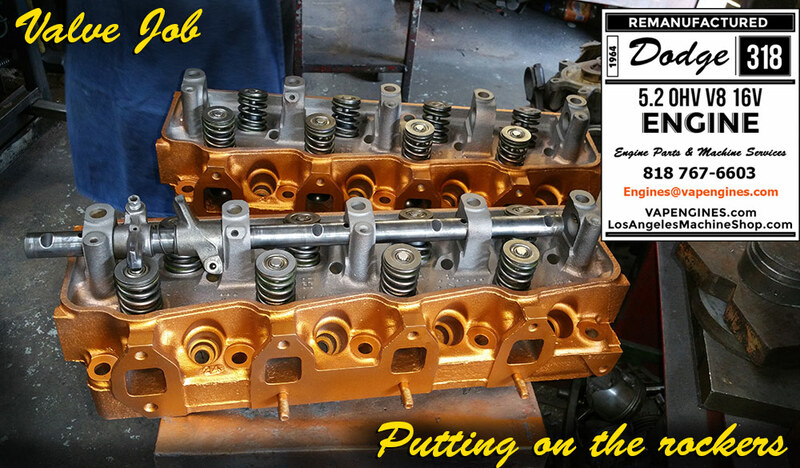 Bore and Hone the engine block, Grind the Cam and Crank, Valve job on the cylinder heads which included new guides, seals and some new valves. 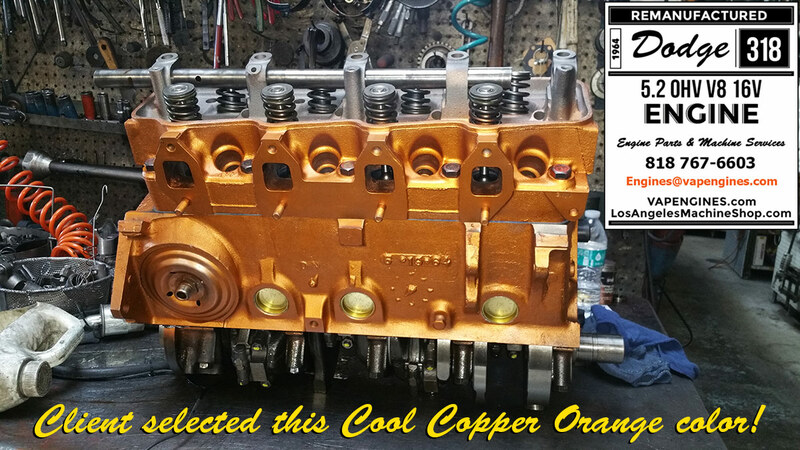 Clean and Painted that cool copper orange color (customer brought in his own paint) and it really “Pops”. Installed New Pistons, Rings, Bearings, Gaskets, Freeze plugs, and Timing set. 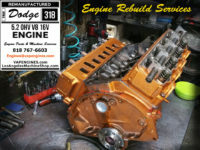 We cleaned up the extra parts, painted a couple, and Assembled the engine. 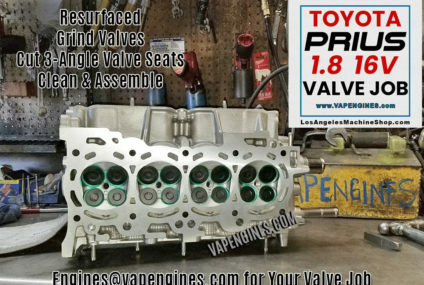 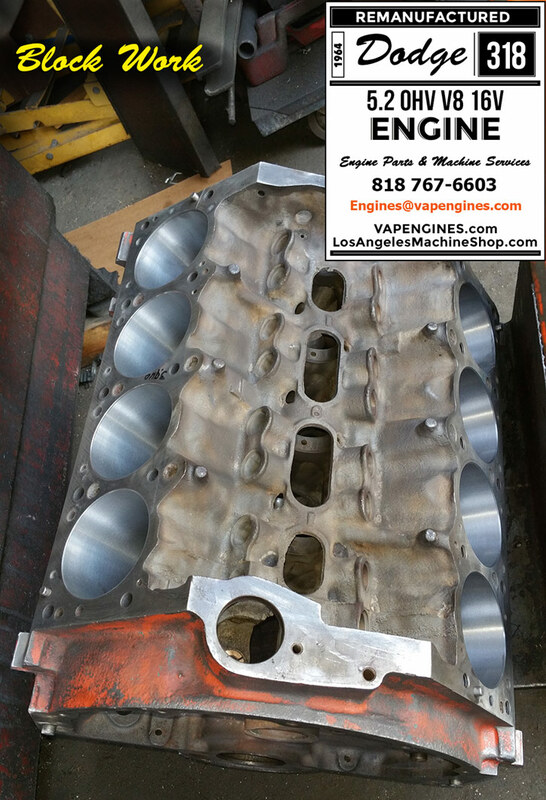 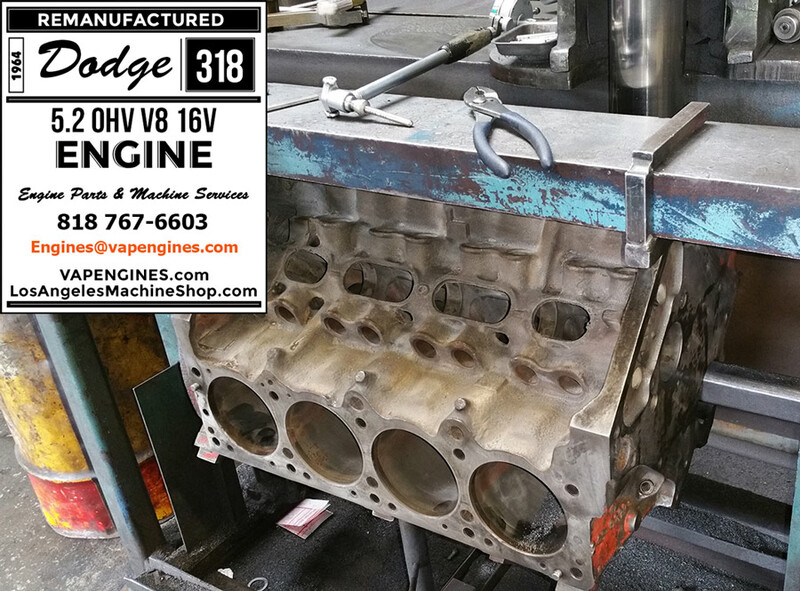 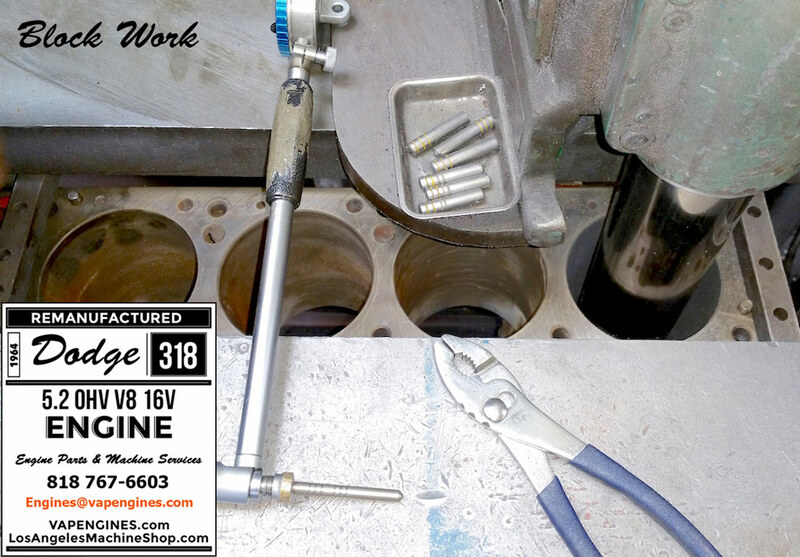 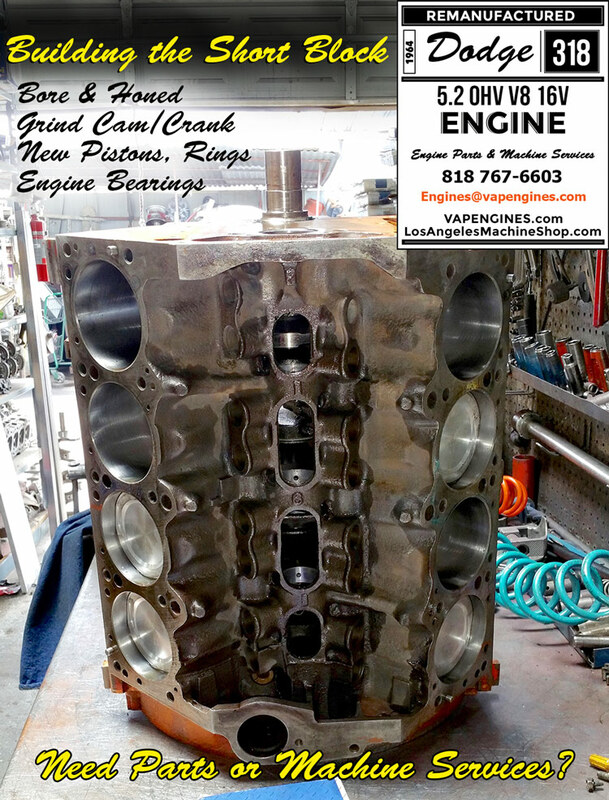 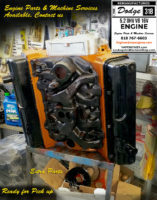 We sell Engine Parts/Kits and Rebuild/Remanufacture Engines here at the Machine Shop. 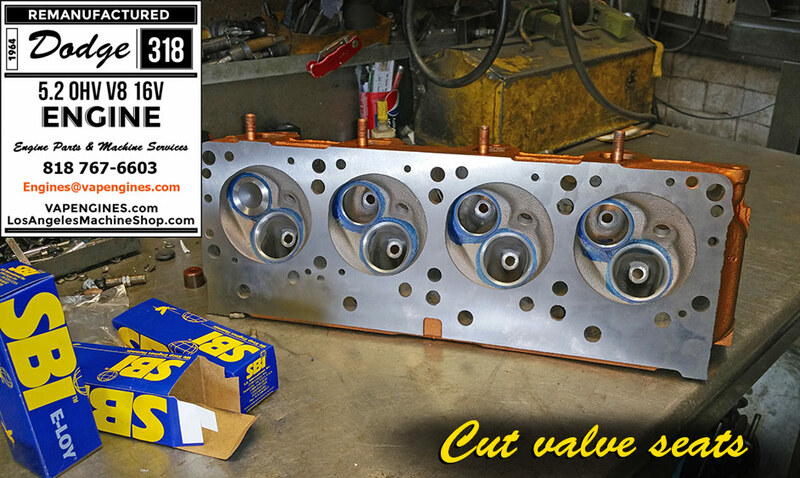 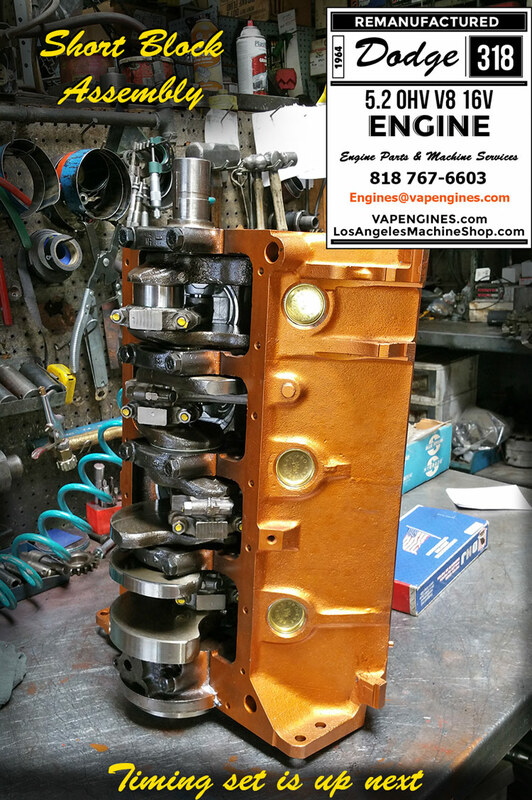 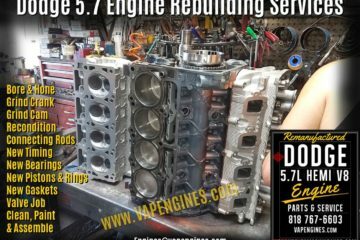 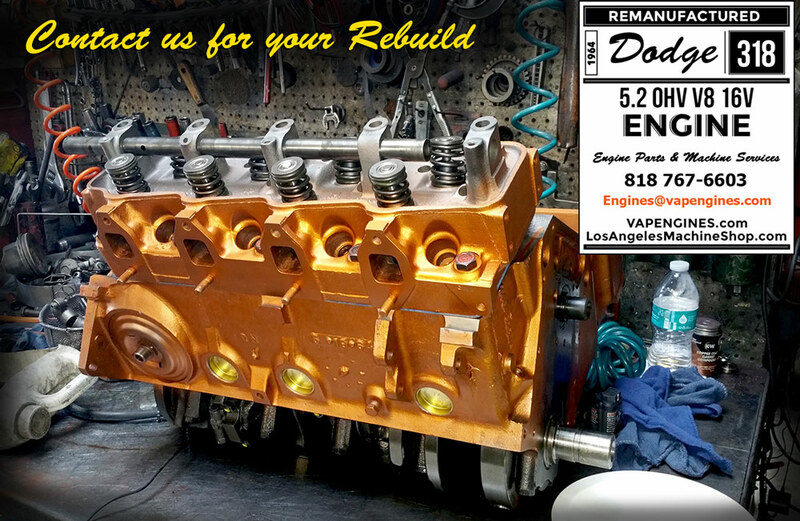 If you have a good rebuildable core, we can rebuild your engine. 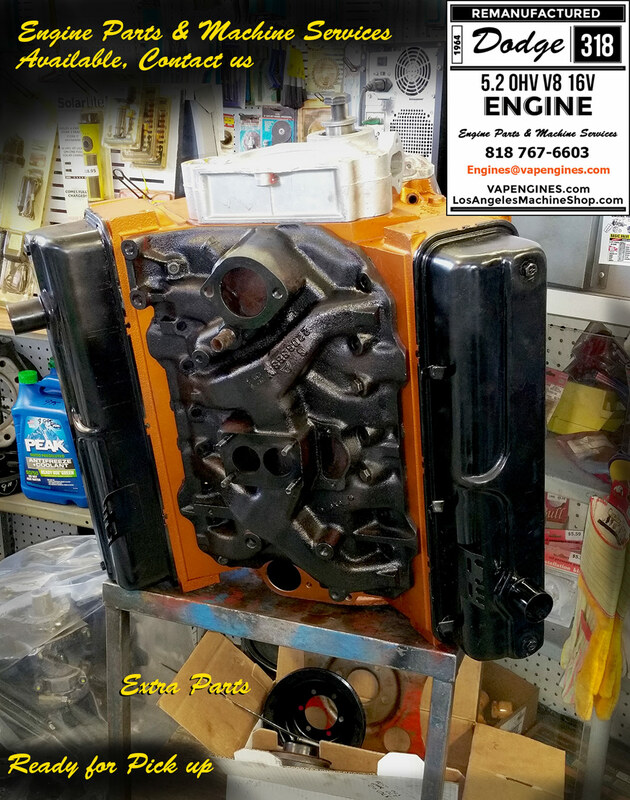 Maybe you have a couple of bad parts, we can source replacements. 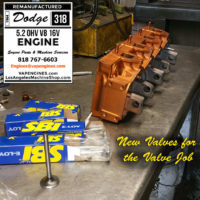 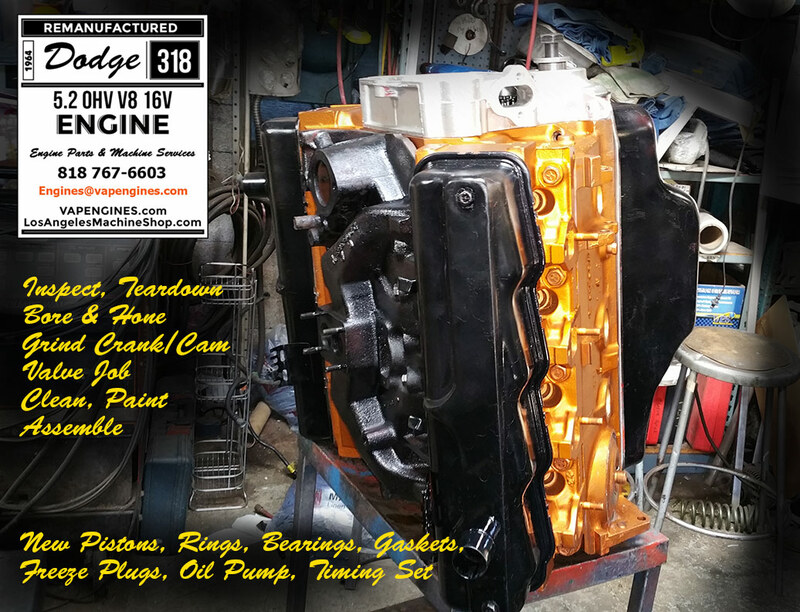 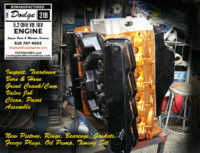 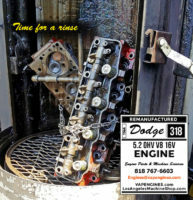 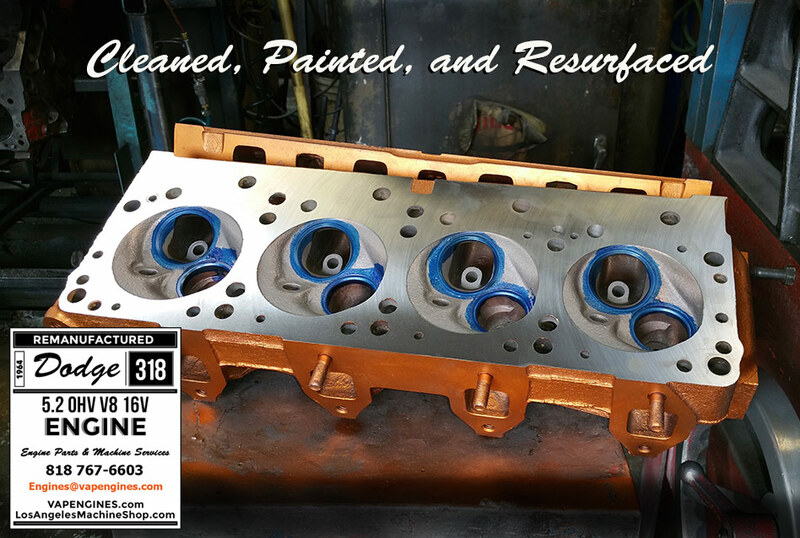 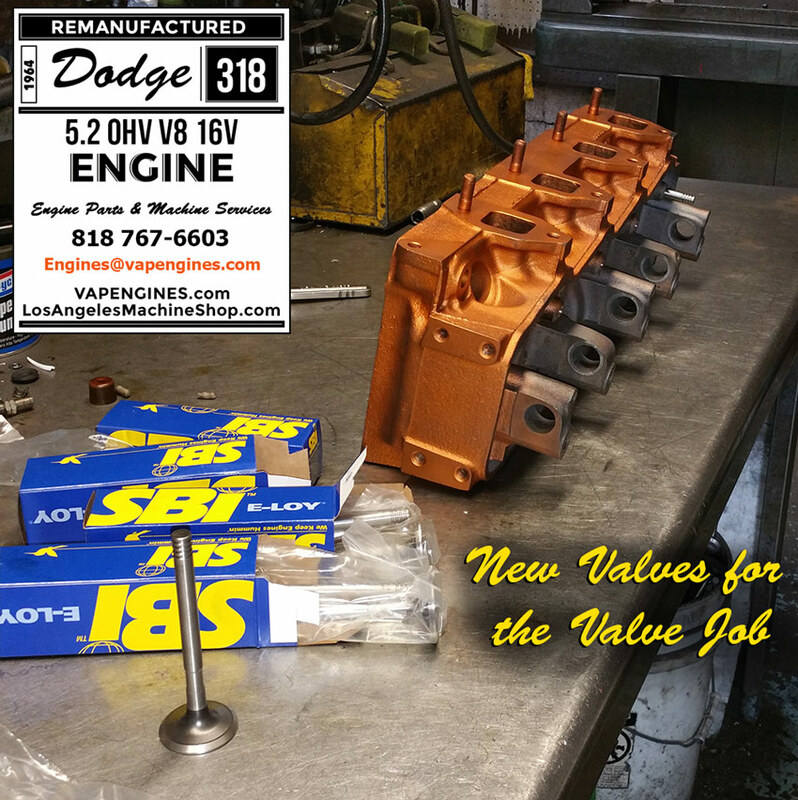 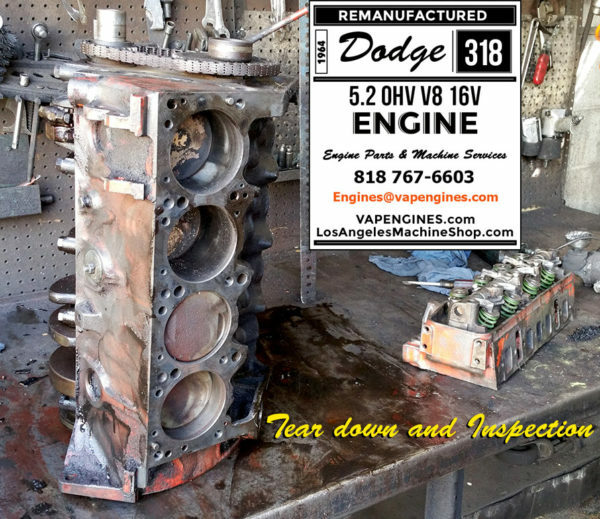 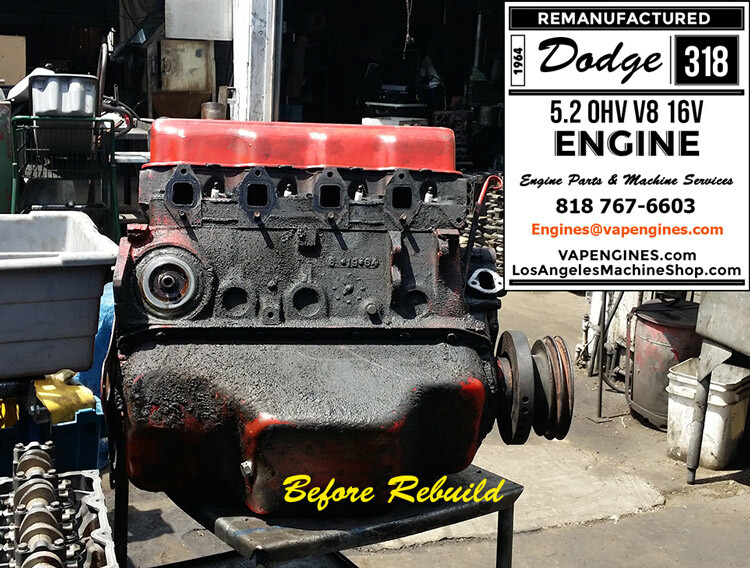 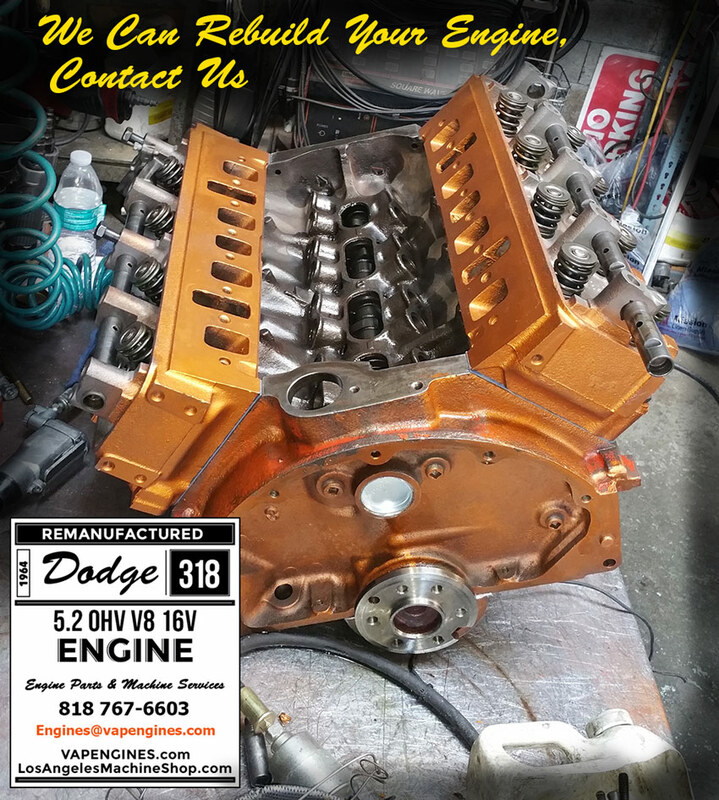 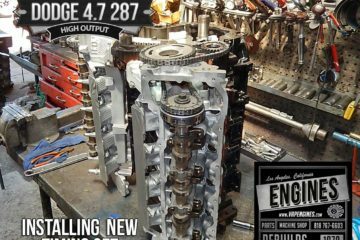 Contact us for your Dodge 318 Engine Rebuild!